Muji fountain pen, Japan; on top of a Clairefontaine notebook, France. It looks like stock photography, but for real, I have one of these pens, and it was only $15. I didn’t know quite how to categorize my survey of objects, and I didn’t attempt anything correct, complete, or philosophic. I just surveyed objects in my life, made notes, and grouped them under labels I made up. As Notorious B.I.G. said: It ain’t no more to it. So, moving on, let’s start from objects closest to me and move outwards. The first item then is the ankle bracelet tracker I wear for my probation after — just kidding! Also, nothing inescapable like a titanium rod, replacement joint, or wedding ring. Uni-ball Roller Micro. I’d never use a blue one like this, though, just the best Google Image Search did for me today. I only do off-black if it’s subtle fountain-pen near-black inks. Amazon $9.06 for 12-pack. Also, levitation. No really, then let’s start with pens — usually a particular particularity among design folk. Sort of an anchor-point for us, or deadly money-sink, fatal albatross.. but I digress. Recently, I have returned to sometimes using the above Uni-ball Roller Micro model which I used way back in high school. I mean, this thing is real vintage stuff, as high-tech pens go. Sharp, great for detail work though. However, I had some years ago defected to, and am still using, the successor Uni-ball Vision Micro, Elite, and lately, Needle models; still ultra fine-point, but later and freer-rolling, higher-ink-volume cousins to the Roller. The choice between them, like the choice of any pen, is a choice of stances towards life. Roller does finer details, but sometimes scratches or runs on the dry side; Vision is expansive, vigorous: more like Whitman’s “barbaric yawp over the roofs of the world,” relatively speaking. Background note: Uni-ball pens are made by the Mitsubishi Pencil Company of Japan. In fact, just about all of the more advanced mass-market pens in the world are made by Japanese companies, although sometimes resold under other brands like Sanford. Japan, and the Japanese of all nations, are a sort of separate planet when it comes to high-tech mass-market pens. I sometimes use the Roller when more precision is required, or when writing on less absorbant paper, or when I’m just feeling especially equivocal about the world, and want to write in a clipped and controlled manner to give away even less. Furthermore, at one point I deduced that in the sketchbooks I was using, typically one side of the paper is slightly more absorbant than the other — apparently due to the sizing i.e. filler coating — enough so that I would switch back and forth between these two pen types while writing in the sketchbook. Yes, this is, as Iago said non-flatteringly about Desdemona, super-subtle. We are that kind of people. Anyone who’s looked at fountain pens online or at a pen store knows that this is not just a market but a obsessive subculture, a connoisseurship system, and a place where you can spend as much money as you want. In case you’re just starting out, or want a handy guide to enclose with a gift fountain pen, see also my printable 1-page guide to how and why to use fountain pens. Pictured is my Muji aluminum fountain pen: ($15.50 at Muji online): somewhat stern, dense, heavy; an impressively precise cylinder of industrial design. It’s solid enough to be, although it isn’t actually, a tactical pen, or pen designed to be usable as a weapon. I kid you not, this is totally a thing. Muji fountain pen, from Muji, Japan. My collection of fountain pens occupies the low end of that field, more or less below the notice of anyone who considers themselves a serious fountain-pen person; yet even some of mine cost dozens of times as much apiece as the high-tech mass-market wonders discussed above. 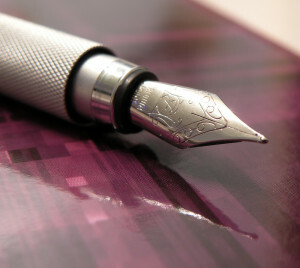 But both mass-market pens and fountain pens are often highly refined, in their own ways: it’s just that mass-market products are highly refined for mass production, competing with extreme quality and reliability in a highly competitive market, rather than in the sacred precincts where fountain pens are sold). 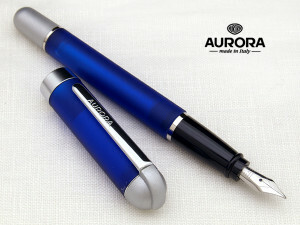 I used to sometimes use an Aurora Idea, a lighter and (dare we say it) chunkier pen. It’s from the esteemed Italian pen maker Aurora, but it’s a mere “student” pen, in the cursory and sometimes hurtful discussions of the online fountain pen cognoscenti. (yes, I’m talking to you, Meisterstück1889, you insufferable snob). Nowadays my “daily carry” (as we of the fountain-pen sect humorously call the pen(s) we take with us when we’re sometimes let out of our cells) is a Lamy Logo, brushed aluminum finish, Extra-Fine EF nib. This pen is German, and I mean, really German. Lamy Logo, brushed aluminum finish. $40, Amazon. Lamy Logo, $40 Amazon. (note, get the right nib! EF is very different than M). 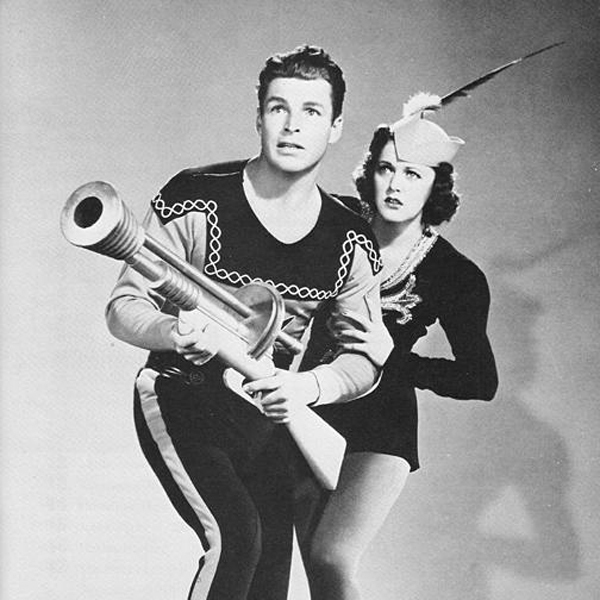 metal ribbing style, as seen in Flash Gordon design aesthetic, c.1940. I feared I would look like this. I have to admit my reservations when I first saw pictures of this model, shopping for an upgrade to my beautifully-performing but ugly (“student”) Lamy Safari Vista. That ribbed metal grip, I thought — isn’t that a bit Flash Gordon for me, just kind of letting it all out? Can I sign the merger documents or treaty with that, in all seriousness? Ink cartridges loading just by putting cartridge in barrel and screwing pen back together. 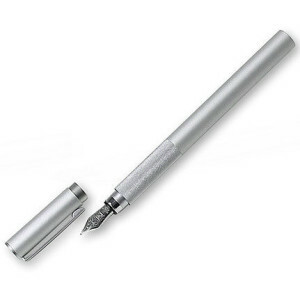 This loads and punctures the cartridge for you, smartly dealing with a key issue of new fountain-pen users especially. “Start-up” (writes immediately, after period of disuse) among best of any fountain-pen I’ve used, except perhaps the Japanese high-tech student pen Platinum Preppy. Spring-loaded clip, i.e. hinged with a spring, rather than relying on the flex of a plastic or metal clip — which, let’s face it, goes wrong sooner or later over the decades. 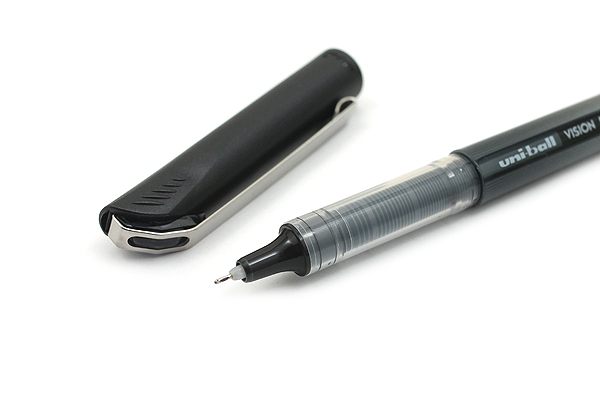 Fountain pen enthusiasts all rave about this classic feature on any pen. Yes, I know, it’s a lot of raving for a small detail, but that’s what we’re all about! Beyond the engineering, I find the Logo impresses in that cool and devastatingly understated way we aspire to. You see an associate using this in a meeting — or that distinguished-looking gentleman in a cafe writing a card or taking a few notes from his pocket edition of.. what is that, La Rochefoucauld? niiice! — and you think, now that is a distinct, considered, discerning choice of writing instrument; an appreciator; of particulars. Is this seat taken? Ok, perhaps you don’t notice it at all.. or him, but if you’re into these things, you may appreciate the taste and statement. Ok look, we notice it ourselves, even if nobody else does. It’s our special, well-considered way of being in the world, at one with our objects if not one with the people, but we’re trying here. Next installment: Pencils, notebooks, and the uncertainty of all judgment; with application to Blogging. Also, don’t forget your free printable 1-page guide to how and why to use fountain pens.